SafePlaceforPets.org is an online resource that connects domestic violence survivors with pet-friendly resources near them. This website is a RedRover project with the National Link Coalition and Sheltering Animals and Families Together. Judy and her dogs, Toby and Mimi, had been living in a car after fleeing from Judy's ex-boyfriend who had been stalking her. Judy suffers from depression and PTSD and her dogs mean the world to her. There was no place for her and her dogs to live together and Judy refused to give up her four-legged family members, even if it meant that she would have to continue living in her car. Judy did some research and found RedRover’s SafePlaceforPets.org website, a national directory of pet-friendly domestic violence shelters. With guidance from one of RedRover’s case managers, Judy found Operation Care, a SAF-T shelter in Amador County, California, that had just opened their doors to pets, thanks in part to a Safe Housing grant from RedRover. 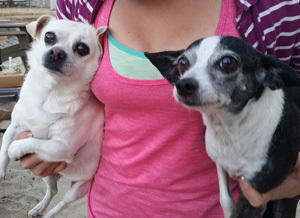 Judy, Toby and Mimi were accepted into Operation Care’s safe house. Toby and Mimi were their first four-legged guests! Judy’s pets were behind on their vaccinations; Mimi had an ear infection and needed to be spayed. All of these medical needs were met by RedRover and Operation Care, and Judy’s dogs received the treatment they needed. Judy, Mimi and Toby now have a safe place of their own. Learn more about SafePlaceforPets.org and the brave woman who made the site possible. SafePlaceforPets.org now has 600 programs listed in its directory, since launching in 2013. Please share this resource with your friends, counselors, peers and family members! You could save a life, or two or three! Lynn and her family had been living in fear for months. Lynn’s two-year-old daughter and their family pet, a one-year-old dog named Coco, constantly witnessed screaming and disturbing behavior from Lynn's abuser. He regularly “tore up the apartment” and had once kicked Coco. Lynn gained the courage to leave their abuser and fled to a nearby domestic violence shelter. The shelter was unable to house pets on site, but Lynn’s case manager knew about RedRover’s emergency grant program. A RedRover Safe Escape grant paid for 30 nights of emergency boarding for Coco and enabled the entire family to start a new life. Daisy, a defenseless seven-month-old puppy, received multiple stab wounds to her lungs and other vital organs at the hands of her owner’s abuser. A RedRover Safe Escape grant paid for Daisy’s emergency veterinary care and ongoing treatments so she could make a full recovery. RedRover’s case manager worked with Daisy’s family advocate to ensure the whole family was safe. Daisy recovered from her injuries and the family is beginning a new life free from abuse. "As you know often victims of domestic violence and sexual assault are traumatized and having their animal companions close by offer a source of comfort when coming into a shelter where they are seeking safety, learning about this new environment and adjusting to finally having safety in their lives. It can all be a bit overwhelming, so your program is a boon to survivors, having their pet close by can provide them with one anchor point and something familiar that they care about, trust and cares about them, that they can return to. I hope the RedRover programs continue for a very long time."